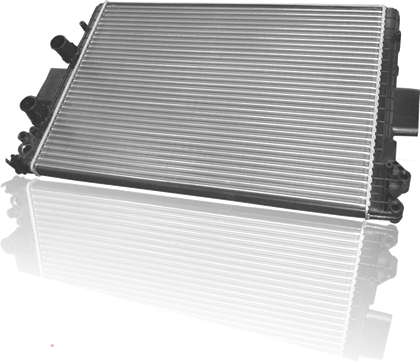 A Radiator is a heat exchanger whose primary purpose is to transfer thermal energy from one fluid to another. In automobiles it has an important role within the Engine Cooling System, transferring heat generated in the engine to the ambient air. The cycle consists of hot coolant coming from the engine which circulates through the inside of the radiator. Ambient air circulating through the outside absorbs thermal energy from the hot radiator. As a consequence the temperature of the coolant decreases before entering again the engine circuit. This cycle is vital to prevent the engine from overheating. First radiators were manufactured in copper. Between 1970s and 1980s the use of aluminum increased leaving far behind copper radiators in vehicle applications. The main advantages of aluminum are reduced weight and cost. However, due to its superior cooling properties, copper-brass is still dominant for high performance vehicles, industrial or agriculture vehicles and stationary applications.